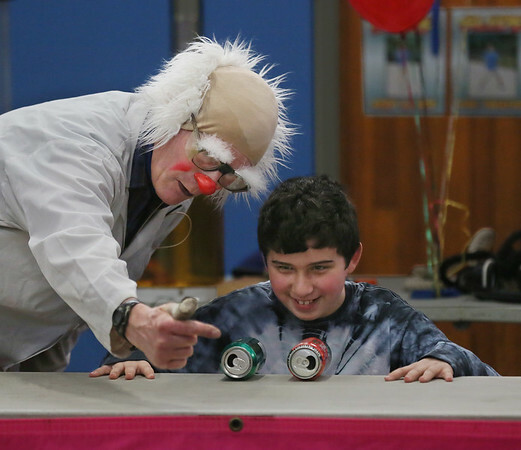 Ted Lawrence of Brattleboro, Vermont, instructs volunteer Sawyer Towne, a fifth grader, how to blow between two aluminum cans to demonstrate Bournoulli's principle during a "Slapstick Science" program Tuesday at Veterans Memorial School. Bernoulli's principal states that when the velocity of a fluid, like air, increases, the pressure exerted by that fluid decreases. So, when Sawyer blew air between the two cans, the air pressure between them decreased and the cans rolled together.